Setanta executives are locked in an emergency board meeting to discuss a rescue package in attempt to stave off administration, the BBC has learned. The sports broadcaster could face administration "within days" unless backers provide more funds, earlier reports suggested. The company needs to pay the £30m it owes to the English Premier League. However, a spokesman played down the reports that Setanta was set to call in the administrators. The broadcaster has already failed to pay the Scottish Premier League £3m it owes in television rights money. Setanta, which shows cricket, golf and rugby union as well as football, has about 1.2 million subscribers but is losing up to £100m a year, analysts say. Deloitte is set to step in to run the firm if it goes into administration. Would-be customers who attempted to subscribe to Setanta through its website were on Tuesday told it was not possible because of "routine maintenance". Meanwhile anybody trying to subscribe by phone receives a recorded message saying that "The service is temporarily out of order". The rights to show the English Premier League - and the subscribers this pulls in - lie at the heart of Setanta's business model. But the firm had only about 60% of the subscribers it needed to break even, said Professor Chris Brady of the BPP Business School. "They have predicated the whole thing on getting those subscribers. 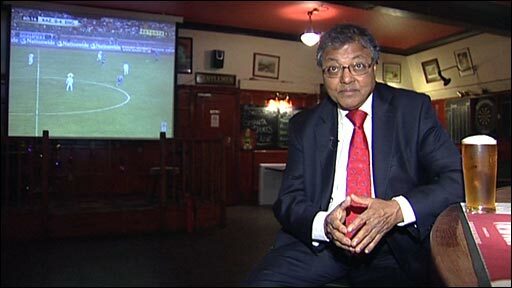 The problem is they are taking on Goliath in BSkyB," he told the BBC. Not only did Setanta have only a small percentage of televised Premier League games but they tended to be "weaker" matches, he added. There had also been problems with customer service, Professor Brady told the BBC. 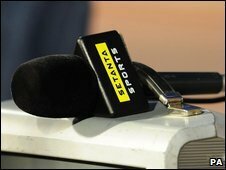 Setanta's viability was cast into doubt earlier this year when it lost the rights to show 46 live Premier League matches from 2010/2011. In future, it will show only 23 games per season, compared with BSkyB's 115, with industry observers saying that thousands of customers would give up their subscriptions. It is expected that a rival broadcaster - perhaps ESPN - would buy up its Premier League football rights. But the worsening economy has led observers to suggest that the rights to 46 games that Setanta holds for next season, the final year of its current contract, would not be worth as much as they had been. There are also doubts about whether the Premier League could match the £159m Setanta paid for the right to screen 23 Premier League games each season from 2010-11. A shared deal with ITV saw them secure rights for England and FA Cup matches for £425m - and it is likely another firm would buy up these rights. One SPL club chairman told the BBC that, if the broadcaster goes into administration, it would be "absolutely horrific" for the future of the game in Scotland. He went on to say that it will have a massive impact on the whole financial structure of football and restrict the clubs' ability to bring in quality players. Players would leave the country in search of better wages and jobs will be lost at all levels within the game. Another SPL club has told BBC Scotland that income from Setanta alone accounts for 33% of their income, while another said it was 20% for his club. "With cuts already being made for next season, the loss of revenue of 20% would undoubtedly have a knock-on effect on and off the pitch," said a source. It is feared that the loss of cash from Setanta could force as many as three SPL clubs into administration.